---Please also note: Due to the conversion from RGB to CMYK, variants in color brightness and vibrance may occur when printed. 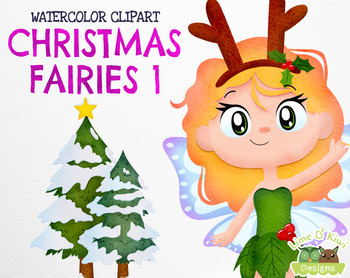 Our Christmas Fairies 1 Watercolor clipart package has been made with love for the purpose of being used on digital products, and for printing! It is perfect for scrapbooking, digital work, stickers or card making! 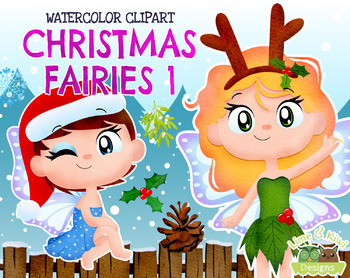 Included in this pack: 6 Christmas Fairies, some berries, a candy cane, a fence, some holly, some mistletoe, some pine needles, a pinecone, 3 snowflakes, a tree and some snowflakes. Includes a Standard License and available for Commercial use with credit. [Please note] All images are approximately 6 inches tall from either their most tallest or widest points. 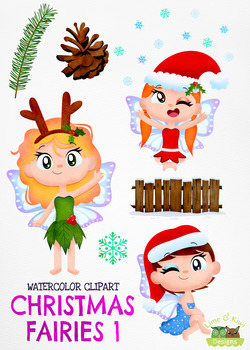 - Clipart saved individually as 6”X6” 300 dpi PNG files with transparent backgrounds. 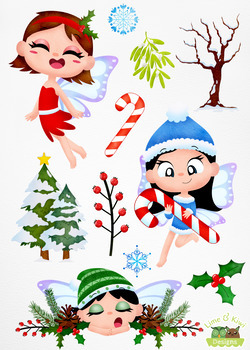 - Clipart saved individually as 6”X6” 300 dpi JPEG files with white backgrounds. All packages include our Standard License. This means all content within the packages purchased are available for Personal/Non-Profit use without credit. Standard license also includes Commercial use for up to 1000 units with credit given to Lime & Kiwi Designs. Once payment has been made, the digital files will be available for download in your TPT account. If you wish to contact us about your order, a query in regards to our products or to issue a complaint, you can do so via limeandkiwidesigns@gmail.com.